I originally posted this in the Reddit comment thread for something else. I am reposting here to give it a more permanent home, and some additional explanation. I recently needed to illustrate an arrangement of Minecraft blocks in isometric view. I have ginned up the tutorial drawing, shown below, so that others can learn how to do this as well. You can do this on paper, or any computer drawing program which supports snapping to edges, corners, etc. and snapping lines to 30-degree angles. I use Microsoft Visio for all my drawings, as it’s what I use at work and I am very familiar with it. On the free software side, you could use Inkscape or Dia. 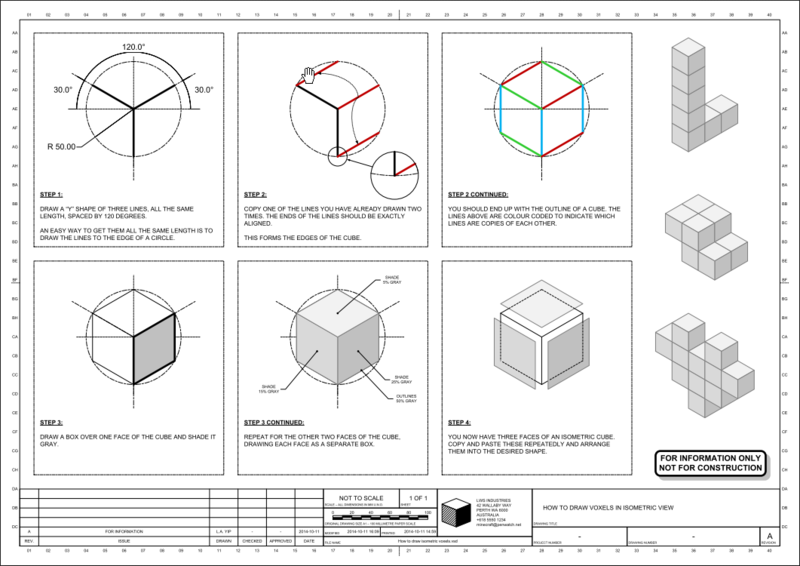 If you were really serious about precision, you could also step up to using a real CAD package like qCAD. Click for full size PDF. How to draw voxels in isometric view.